The first European settlers to the New York area were from Netherlands in the year sixteen hundred and twenty five. 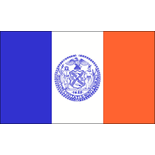 That is were the colors blue, white and orange for the city of New York flag come from. The Netherlands flag is orange, white and blue bars of equal dimensions. The state seal in blue has the number 1625 in it to designate the year the settlers arrived. Flag-Works over America has the City Flags available for purchase in sizes of 2×3, 3×5, 4×6, 5×8, and 6×10. All the flags are made in the USA with 200 denier nylon. The flags are heavy duty with a header and grommets. If your city is not in our list maybe we can make your city or town flag too. This entry was posted in City Flags and tagged city flags, custom city flags, New York City flags, NY, NY City flags, town flags on October 12, 2012 by admin.